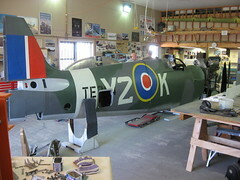 I went up to Comox this weekend to see the Y2K Spitfire Group's project. It was a beautiful grey West Coast day when I boarded the ferry for Nanaimo. I was nearly born on the Horseshoe Bay - Nanaimo ferry. At least, that's the family legend (as is the legend that I would have had free ferry rides for life if only Mom had been a little swifter). Only a few hours after disembarking at Departure Bay, my mom went into labour and out I came. My earliest memories are of our house on Beach Drive, overlooking the ferry terminal in Nanaimo, hearing the occasional grinding crunch as one of those immense vessels carried a little too much momentum into the dock. BC Ferries have always been a part of my life. Ray met me at the Departure Bay terminal and, after picking up my dad in Parksville, we drove up through steadily-strengthening sunshine to the Comox valley and the Canadian Forces base up there. Ray and my dad have been friends for nearly forty years -- ever since my dad (who was then a social worker in Drumheller) helped Ray and his wife adopt a son. They're nutty gearheads who are never happier than when tinkering around in a workshop surrounded by half-a-dozen half-complete projects, telling each other stories they've told each other a dozen times. Their shared love of cars is something that goes back to their early days together when they drove English sportscars around (my dad had an Alpine Sunbeam). Many of my early memories also revolve around helping my dad in the garage, learning about internal combustion engines and the proper use of curse words. And inhaling the family legends, like the indestructibility of our old Dodge Valiant, and my almost-brush with BC Ferry history. I heard about the Y2K Spitfire a few weeks ago, when by chance I saw a two-page spread in The Province on the project. These lads have acquired a Mark IX Spitfire from South Africa, where it crashed in 1952 and was consigned to a landfill. They dug it up in the landfill, had it eventually shipped to Comox and have been steadily re-building it over the last few years. It's still quite a ways from completion, but it's a beautiful sight. The Spitfire also looms large in my early memories. As a kid I had a scale model construction kit of a Spitfire. I treasured that model plane, even though I hadn't done the canopy right and had smeared the clear plastic with modelling cement. The wheels folded up into the undersides of the wings, and I can remember very clearly the panels on the landing struts that fit into the wing surfaces so that the whole underside of the plane was smooth and unbroken. I devoured stories about World War Two aerial combat, inhaling whole and undigested the lore and language of those young men decades before I was born. I was crushed to learn that fighter pilots required 20-20 vision; with my glasses my dreams of being a glamourous, reckless, cocky young fighter ace were dashed. 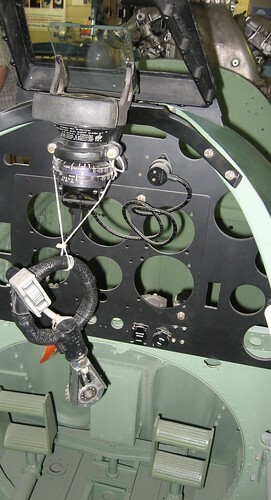 Although piloting a jet could never be as cool to me as flying a Spitfire. The Spitfire was another legend I ingested as a child. Arriving at the Tet Walston Memorial Hanger, where the Y2K Spitfire is under construction, I was practically hopping with excitement. At the front door we were greeted by two of the volunteers working on the project, Mike and Pat, who were great hosts and more than happy to show us around and explain the many mysteries of their workshop. 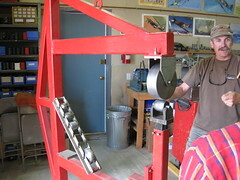 Here Mike's showing off the English Wheel, which is used to curve the aluminium panels that make up the Spitfire's fuselage. It's been quite a struggle getting the panels just right; apparently the Spitfire is a plane composed entirely of curves -- no flat surfaces ANYWHERE, so every single panel has to be painstakingly molded by hand. They've certainly done a great job so far. The fuselage is complete now from the cockpit all the way back to the tail. There are many of those aluminium panels forming the body of the plane. The seams and rivets are perfectly flush with the plane's body. It is smooth and sleek and sculpted. This is an object whose obvious purpose is to go fast. Very, very fast. I couldn't stop touching it. Even in its half-completed state it fascinated me. Ray and my dad discovered that Pat had, like them, grown up in Calgary in the 50's. They traded many stories about Calgary and aviation. My dad told his story about the mid-air collision between a Tiger Moth and some other craft; he and his brothers beat the fire trucks to the crash scene. Ray mentioned how his uncle Tom had been an aeronautics engineer in Calgary involved in airplane reconstruction. Pat beat them all with his story of how he FAILED to go up in the restored Lancaster that flew once from Calgary airport. "F For Freddy" -- the Mosquito that crashed into the Calgary air traffic control tower on May 10, 1945. The guy who landed his Tiger Moth atop the carousel at the Stampede. Sitting and listening to them, with nothing of my own to contribute, I felt like a five-year-old listening to the grown-ups talk. But I was more than content. It's liberating to just listen sometimes, and to feel no pressure to contribute. We're so trained to contribute, to deliver information, that it can be wonderfully soothing to just shut up and listen for a while. It's rare that we get explicitly rewarded for actually listening, compared to the congratulations and fuss we get when we speak up, that maybe it's not so surprising, but still, listening is a joy and I like few things more than hearing a great legend well told. The gunsight triggered no end of thoughts and stories in my own mind. Trying to imagine a pilot keeping one hand on the control grip while the other adjusted the ranges on the sight, all the while keeping a dashing, darting target before him (one that's constantly adjusting its postion relative to his in three dimensions, at a combined speed of probably 600 miles per hour or more), I understood all the more clearly how it wasn't just my weak eyesight that kept me from being an ace pilot; I would never have possessed the necessary coordination to handle all that. And when you think of how rare an individual who COULD manage all those skills with any degree of competence must be, and you think of how of those individuals, how many didn't survive more than a few missions, the real scope of the tragedy of war somehow seems even greater. Those boys weren't just anyone; they had brains and skills and physical gifts beyond what most of us have. And they got shot, or trapped inside burning, plunging aircraft, or were blown to pieces in the sky by other young men just like them. I read so many books about aerial combat and yet I know almost nothing about these aircraft. I've never flown one, I've never sat in one, and until today, I'd never touched one. Looking into the cockpit and imagining the roar that immense engine must give out, trying to picture the rush that just touching the throttle would give one, never mind getting the thing up into the air and responding to your commands, was enough to shake me. I don't think you could ever be the same after controlling one of these machines. 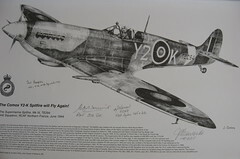 At the end of our visit Pat thanked us for our time and our donations, and I came away with this beautiful print, signed by four actual Spitfire pilots. It's a lovely memento and a great reminder to me to get back to Comox and watch the progress these lads make on this beautiful aircraft. As we were leaving, a tour bus pulled up and a whole raft of Chinese tourists came tumbling out, all piling into the workshop to see the Spitfire. I couldn't help wondering what they made of this half-finished English warplane from sixty years ago and the men who were giving up their free time to restore it. I didn't ask, though. Pat mentioned that this tour company brought a busload by every two weeks, and if nothing else, they bought lots of souvenirs. The world has moved on very far and the river of time has torn down mountains since young men climbed into their beautiful, deadly, fragile Spitfires, and roared up into the sky to kill other young men. Now tourists from halfway around the world come to wonder at such a machine. And meanwhile young men continue killing each other, with nothing as beautiful as a Spitfire, I suppose, but the dead are just as dead. But I remember lying on my stomach and studying a bit of molded plastic, dreaming of flight and freedom and saving the world. I would have given anything to fly a Spitfire, or even just to see one. And now I have. Time rumbles on, but dreams and legends and death and beauty never seem to quite go away.